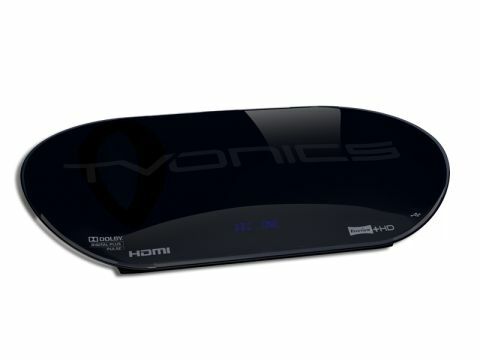 Aside from the curved and tilted design that recalls some of Samsung's Blu-ray players, this Freeview+HD recorder from British company TVonics has a unique feature in that it also works as a hi-def hub. On its rear you'll find not only a HDMI output to send hi-def pictures to your TV, but also a brace of HDMI inputs. They're labeled for 'games console' and 'DVD player', though anything that uses a HDMI cable can be switched, typically a Blu-ray player. Other connections include two USB inputs – one on the side and one on the rear – both of which can accept memory sticks or external hard drives stuffed with digital media. If that's useful, so too is its 500GB hard disk that's able record around 70 hours of HD programmes, or around 255 hours of regular standard definition fare. It's not quite up to the standards of the latest Sky+HD box, but it's as big as they get in the Freeview HD market. Recording functionality is relatively advanced, with its dual DVB-T2 tuners allowing you to record two channels at once. Recordings can be set from an eight-day electronic programme guide, while all the latest Freeview+HD specs are on board. There's also a media player that shows only JPEG photos from a USB stick, and an Ethernet LAN port that's largely redundant – there's no media streaming here. And nor is there a Common Interface slot, so Top-Up TV is off the menu.